No, I didn't lose my new cam. I was the one lost this morning in a picturesque neighbourhood but without having brought Baby. I had an early doctor's appt seeking help with these recurrent migraines and I thought about but decided not to bring the camera because I was exhausted and didn't feel like toting any extra weight. Well after being handed a typical prescription from a typical "Oh the cause? Who knows, here's some drugs" doctor, I decided to walk slowly home rather than take the metro because the sun was shining very warmly and I hadn't had much exercise this week. Plus I'd only once been in that neck of the Tokyo woods and I wanted a look. Well not far from the very urban Tokyo Tower and all sorts of other big city stuff, I stumbled down some back streets that seemed transported from a little town in the Japanese countryside. I even saw some peachy-coloured humming-ish type birds fluttering around a flowering aloe bush in a big pot outside of a little old house. Of course everything had a dull patina of soot since I was not far from two overhead freeways. I don't think I'll ever get tired of how the old and new intersect here, so gracefully. Nor will my wonder cease at how nature thrives amidst the endlessly spewing emissions. I just found out that it's 15 C outside right now and I have yet to leave the house today, idiot that I am! By 8 a.m. I had already regretted my crack of dawn decision to stay home rather than get up at 5:30 to go with Aran and a few friends to see the fish auction at Tokyo's famous Tsukiji fish market, followed by a sushi breakfast. I was tired after attending a birthday party last night and one sangria too many considering I had been fighting a migraine for a few days. Plus I told myself, hell the market's not going anywhere, I still have 3 1/2 years to get there. But as the morning wore on, I remembered that there was an after-market plan to go on a boat ride and do some other stuff and I started to feel sorry for myself for being alone on a Saturday. But it was my own dumb fault and it's now time to remedy the sitch and get the heck out of the house in honour of my poor friends and family living through an Eastern Canadian winter. Made you look! But this post is actually about music and not ess ee ex. I'm right now listening to my new CD, purchased Friday evening when I made the fortunate decision to force myself to go out with some friends, though I really wasn't in the concert mood and poor Alain had to work. I didn't know any of the 4 Canadian bands very well, despite the fact that they're some of the hottest back home right now. But hey, I'm getting on in my years so that's my excuse. The headliners, the New Pornographers, turned out to be my least favourite (and do not to me evoke erotica in the least) whereas I danced my longtime-ska-loving-feet off to Bedouin Soundclash, and also did a wee bit of lusting for singer Jay Malinowski. But as usual, I digress. I arrived late for Jason Collett but what I caught was quite entertaining and Amy Millan was pretty good too, though her twangier tunes lost me a bit since I ain't a country fan y'all. And there were certainly a lot of Canadians present and most were quite enthusiastic, particularly for the Pornographers, but there was also a decent and receptive Tokyoite turnout in the end, despite low advance sales and a late-week PR entreaty for embassy attendees to pad the joint. Aside from the lame play on words, my post title is also a ref to how crowd reaction at the show, and discussions amongst our gang at an izakaya after the show, underscored to me how stubborn most people (myself as a BIG example) tend to be in their musical tastes. You love this and ick that and it's unlikely anyone can EVER convince you otherwise. Or me anyway... Ska rules! On another, distinctly non-musical note: I start a new part-time contract at the embassy on Monday for a couple of months, helping a different department this time. It's perfect timing because we need the scratch for our mid-Feb. trip to Boracay, Philippines, aka paradise. We proudly proclaim that we survived the Crash Test Parents Weekend! In fact we did more than survive, I had some special moments that are still making me all warm and fuzzy when I think of them, including an adorable 5-year-old's gleeful Naked Dance while he waited his turn for the shower, and observing the patience of an exemplary big brother who ate every single thing I put in front of him (plus his own creation of ham-wrapped kiwi) without any coaxing at all. I just hope the temporarily liberated real parents enjoyed themselves somewhat, despite their many phone calls home and our one final failure; to persuade their middle child, a charming yet ever so mischievous 6-year-old, to do all his homework. And we're very happy that they chose to show their appreciation with a big box full of the specialty of the region in Northern Japan they were visiting: scallops. We had a few (on the shell) for dinner tonight and they are the freshest, best ones I've ever had. Bring me your children and succulent seafood. Hahaha. That actually sounds more Hansel & Gretel than I intended. If anyone's wondering what has happened to me because I'm kind of behind in my e-mails, I'm on the second day of my 3rd migraine since Saturday. In other words, my head's been pounding for most of the last 6 days. Don't know what the deal is and am thinking I should schedule a doc appt to see if I can get some real drugs because Advil just ain't doing it for me this time around. Miso hasn't made me any genki-er either, dammit. Stress certainly isn't the culprit so I've considered a pollution allergy as a trigger because I was outside for many hours Friday, Sunday and Tuesday, the days before the start of each of the recent brain aches (and also because my eyes burn and my nose runs a lot when I'm outdoors). But then it could just be barometric pressure or something, who the hell knows. Frankly it dismays me that the scientific community knows about as much about gray matter as they do about cosmic dark matter but then I tend to be very grumpy when my skull is squeezed. Allz I know is that I MUST recover soon because we are babysitting 3 occasionally rambunctious little boys for the whole weekend while their parents attend a curling tournament in Northern Japan. So what was I doing outdoors so much recently, you might ask? Well Friday I just walked around, in a direction I've never taken before, for the benefit of my new camera (aka Baby). Saturday it poured Olympic-sized pools nevermind buckets all day so Sunday we were raring to go when we saw the blue sky. We walked to Harajuku, through Yoyogi park and over to Shibuya to go to HMV and buy a few CDs at the huge sale they were having. Alain bought some Johnny Cash (we recently rented Walk the Line) and I bought Offspring's greatest hits and yet here we are, together 4 years now, go figure. Last but not least, Tuesday I went walking and shopping with my friend B. The worst part about my sore cerveau is that last week I was really making headway with my New Year's resolution and I benkyou shimashita (studied) my face off. This week I've tried but it just ain't the same with cotton and thorns stuffed in up there. But that's enough whining. Sorry, my life really is not very tough so I'll shut up and go have a nap now. Just appreciate and enjoy your unswollen brains folks. I'm anxious to go out shopping today with a friend so as to see whether life is returning to Tokyo. It's been so strangely quiet in most neighbourhoods since last Friday, 29 Dec. It's kind of spooky and Aran has been cracking jokes about Tokyo having transformed into Ottawa. Yesterday I went to Shinjuku, an always-packed shopping area, and it was very very busy. So I guess that is where everyone was because later, around 6 p.m. I was able to race my bike along the sidewalk of our local mainstreet to the grocery store, which normally would not be possible due to the density of rush hour pedestrian traffic. It seems that the first few days of the year are giant boxing day sales at big stores, while many small shops and most offices remain closed. I guess things will get back to normal next week. In the meantime, we're enjoying it. On Tuesday, we even went with some friends to a nearby Shinto shrine to have dinner at the yatai (food stalls) that set up outside of shrines for the first few days of the year. There were even some game stands for the kids. It was pretty quiet so we were able to take our time and cruise up and down the 15-odd stands on each sides of the path. 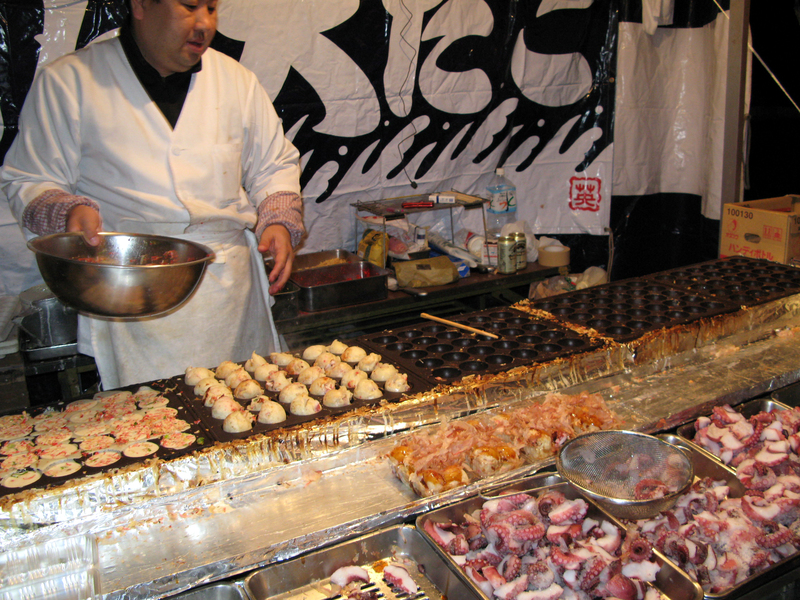 The octopus balls (pictured here) were my favourite. They're a crepe-like dough with a piece of octopus in the middle, cooked in these special round waffle-griddle like things and covered afterwards with mayo and all kinds of toppings. The giant shrimp fire-grilled on a stick was oiishii (delicious) too.